The Supertones perform at over 70 weddings every year. We understand that the entertainment is such an important factor of your big day. That's why our aim is to make this part of your planning as stress free as possible. From the second you decide we’re the band for your wedding, your wedding entertainment is in good hands. We’ll be in touch around 3 weeks before the big day to finalise the details, timings, song choices and any other queries you may have. 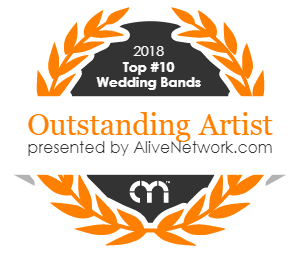 In the run up to your wedding, you’ll also have a dedicated event coordinator from our agency, Alive Network. his name is Marc and he'll be more than happy to liaise with you on any additional issues, questions or concerns. 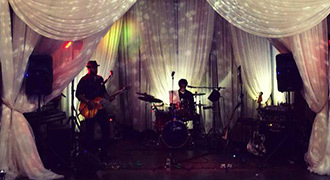 After we’ve set up and sound checked, we will arrange background music to warm up your guests before our first set. All we need is a secure changing room (not the toilets! ), which should be arranged between you and the venue. Our 'rider' is simple and the standard for any band – just a hot/cold meal and soft drinks. Our first live set usually lasts around 60 minutes. Afterwards, we'll take a break – this is the ideal opportunity to serve any food. During this time, we'll play carefully chosen background music to keep the party flowing. If you choose our DJ upgrade option, a member of the band will run the DJ rig and be on hand to take requests and make announcements. We will liaise with you or the event manager at your venue to confirm the timing of your first dance, and will be ready to DJ your chosen track or perform it (if arranged in advance). We also appreciate that schedules often slip on the day. Our experience means we can take any adjustments in our stride. After our second live performance, we will provide background music or pre-arranged DJ service to bring the evening to the perfect close. After the agreed finish time, we will we pack down our equipment as quickly and discretely as possible. This usually takes under an hour. 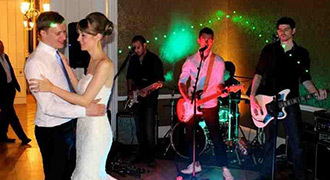 For ten years we've been providing live music for countless satisfied couples. We are proud of the service we offer, but don’t just take our word for it. Take a look at our recent testimonials below. If you have any other questions or would like to discuss things with us in greater detail, please feel free to get in touch with our agent, Marc on 0845 108 5500, who will be more than happy to help!